Following on from a successful collaborative tour in 2013, Laura Cole's Metamorphic and Royst Trio led by Kari Bleivik have launched a Kickstarter campaign to raise funds to produce an album together. The 2013 tour coincided with the release of Metamorphic's second album, Coalescence (which received a 4-star review from John Fordham) and was supported by the PRS foundation. The two groups performed together to critical acclaim and now wish to bring the musicians back together to made a studio album of original music. 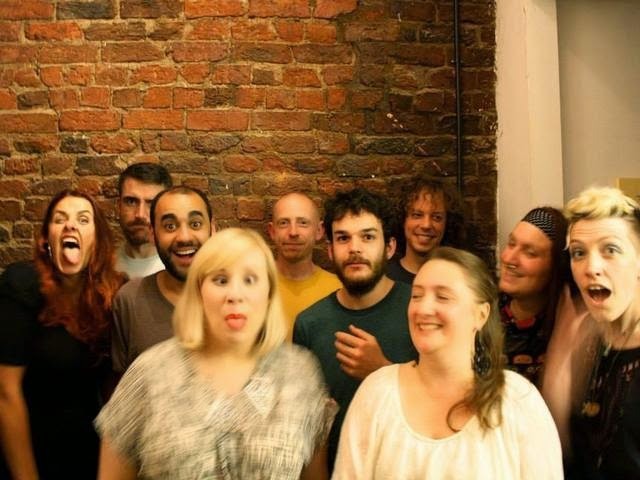 With Metamorphic bandleader Laura Cole knowing the members of Norwegian vocal trio Royst (www.roystrio.com) from her time in Leeds, they decided to create a tour where both groups would come together, writing new material and rearranging previous work. The lineup was made complete with very special guests Seth Bennett (www.sethbennett.com) on double bass and Ollie Dover (www.shatnersbassoonband.com) on bass clarinet. The result of this collaboration was a special musical chemistry, leaving a profound mark on all involved (as you can see from the photo). Here's a great review of the Royst/Metamorphic gig at the Vortex on 25/06/13, which was the official album launch gig for Coalescence (http://blueflamingo.eu/music/reviewmetamorphicroysttriovortex/). The Kickstarter fund would allow the musicians to pay for studio and rehearsal time, sound engineer and mixing/mastering amongst other things. Their target is £2,000 and the campaign ends on 24th October. More information can be found on the Metamorphic & Royst trio Kickstarter page.